Is it just me or is “surfing” one of the first things that pops into your head when you think about Australia? Not that Australia is the only country where you can surf, not even close! But it just has that vibe, you know? Warm weather, tropical beaches, blue water, blonde-haired surf dudes and chicks, Rip Curl and Billabong… Surfing is just Australian culture. If you don’t go surfing once when you’re traveling in Australia, you’re definitely missing out! This wasn’t my first time trying to stand up on a surfboard, but I was probably one of the few people that had tried surfing before Surf Camp. I was super stoked that I was surrounded by people that all came to try surfing for the first time. You don’t feel like you’re better or worse than anyone. Everyone is on the same level, a.k.a. the beginner’s level and the only reason why you’re together at Surf Camp Australia is to learn how to surf, have a great time and make memories. Since I only have weekends off, I did the Weekender / 2-day Surf Camp. Over the whole weekend, there were 3 full surf lessons, which is very intense..but amazing! 2. The itinerary: Sleep, eat, surf, eat, surf, eat, party, sleep and…Repeat! Every experienced surfer can make it look so easy, but it’s actually a very difficult sport. It can be quite exhausting and everything depends on what mother nature decides to do with the weather that day. There are 3 factors that determine whether you’ll have an easy or hard time surfing: waves, wind and tide. Luckily, there are plenty of professional surf instructors at Surf Camp to teach you how to surf in different weather conditions. That’s what I liked the most about Surf Camp! 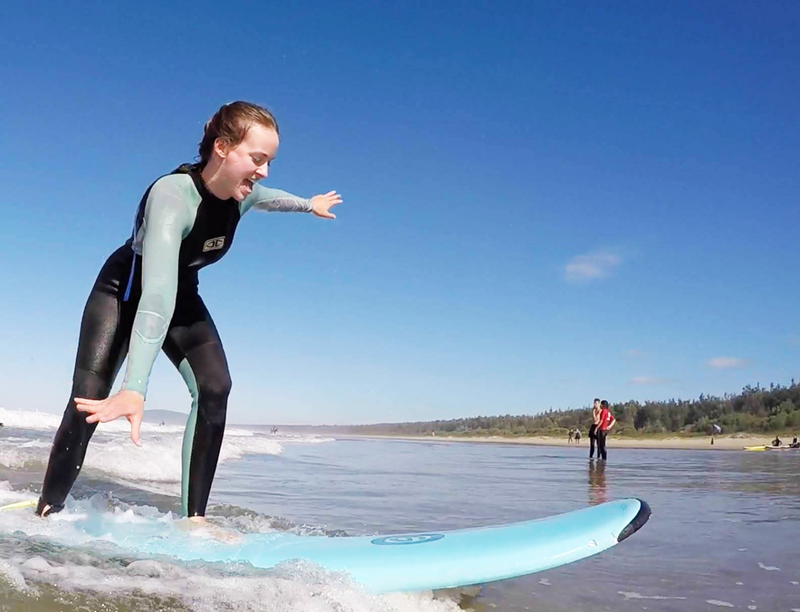 You’re at camp with a big group, but you still get individual help during the surf lessons. When I was at Surf Camp, my group consisted of 50 people! It was great to be able to meet so many people and I felt like I became part of a big family of beginner surfers. But 50 people is quite a big group to learn how to surf. So to make the surf lessons more productive, they put us into much smaller groups, of about 10 to 15 people. For each small group, there were 2 surf instructors, which is why everyone at surf camp had the chance to receive some individual help each surf lesson. The surf instructors go into the water with the group without surfboards and help you pick the best wave and get onto your surfboard. Too bad I wasn’t able to do the 5-day Ultimate Surf Camp, because I definitely would have become a professional surf chick if I would have had more time to practice! When you arrive at Surf Camp Australia, it looks like you’re stranded in actual surfer’s paradise. Everything is colourful. There’s sand everywhere, palm trees, fun surf quotes in the cabins – an instant feeling of holiday and summer! But it’s mostly the instructors and people that work at Surf Camp that make you feel like you’re in paradise. They live and work at Surf Camp every day and the only thing they want is for you to have a good time. The atmosphere is great, peaceful and super laid-back. 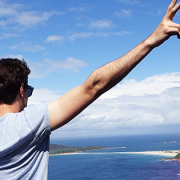 All of them use Aussie slang, make Aussie jokes and they make you do the shaka sign probably every 5 minutes! In other words, it’s the actual Aussie experience and it’s awesome! You know that feeling of terrible hunger you get after you go swimming? Well… imagine that feeling, but 10 times worse. Surfing takes up so much energy and you’re literally starving when you’re done with a surf session and you get out of the water. 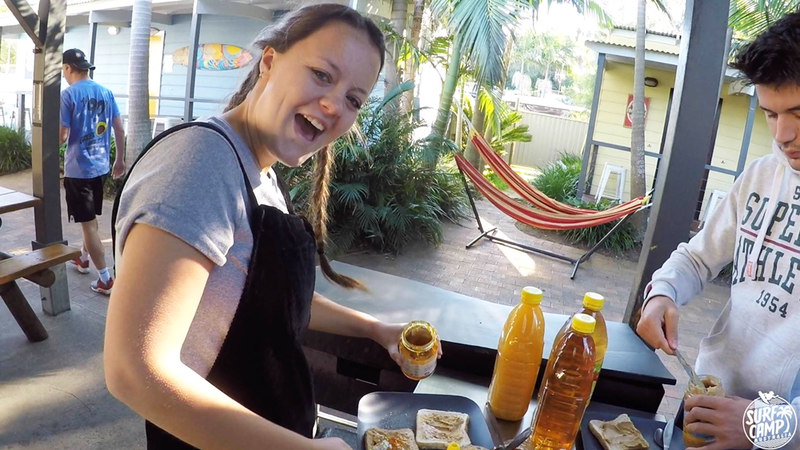 Luckily, the kitchen team at Surf Camp Australia are life savers (aka incredible chefs) and every time they manage to make the best food ever. When I was at Surf Camp, they prepared the yummiest meals for us. Hamburgers, ham rolls, pasta bakes with delicious barbecue meats,… It was heavenly! Not only is it the best food you’ll ever have, it’s also the most food you’ll ever eat in a couple of days. The last thing they want is for you to starve, so they will make so much food, your plate will be overflowing and you won’t be able to carry it back to your seat! It’s autumn in Australia right now and when I was at Surf Camp, which is 2 hours south of Sydney, the temperatures were quite low, around 20C degrees. You couldn’t really walk around in shorts and we had to turn on a heater in our cabin at night. Now you’re probably asking yourself, why would you go to Surf Camp in 20C degree weather? That’s way too cold! But I can honestly tell you, the weather conditions were perfect. The sun was out and there wasn’t any wind. They actually made everyone put on sunscreen because even though it’s not the middle of summer, we would definitely get sunburned. Also don’t forget that if you go surfing, you have to wear a wetsuit. It protects your skin from scratches and rashes from your surfboard, and it also makes you stay super warm when you’re surfing in the Pacific. Don’t think about it, just do it! 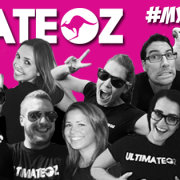 It has definitely been my best and most fun weekend in Australia so far. I loved it so much, I might actually go back next month. Two days is just way too short. If you have the time, do the 5-day Surf Camp. You’ll be able to have the full experience, make a lot more friends and for sure be a better surfer after 5 days than in only 2 days. And just so you know, Surf Camp doesn’t only include return transfers from Sydney, your accommodation, all meals and surf gear. 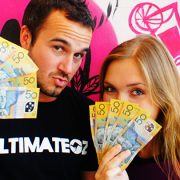 You’ll also get free photos and videos of you surfing & extra freebies such as an awesome Surf Camp t-Shirt, cap and a $20 Rip Curl voucher! Want to learn how to surf? 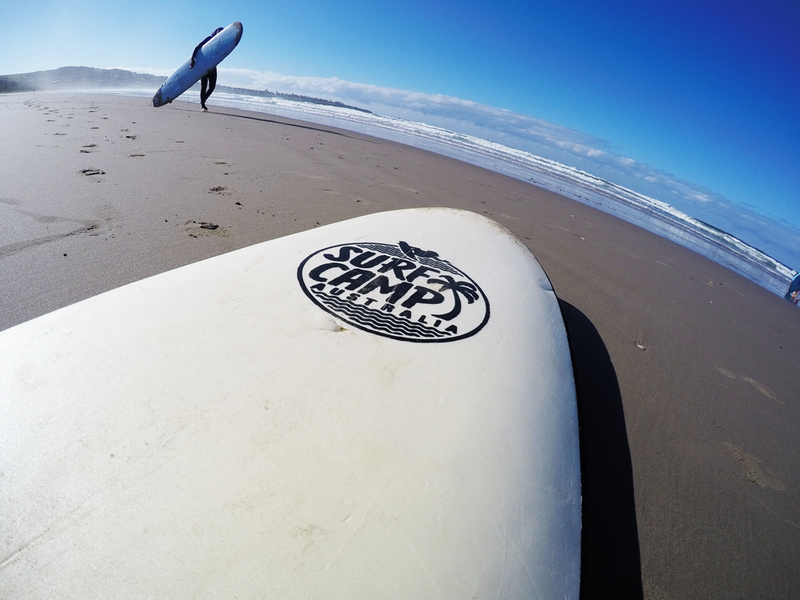 Check start dates and book your Surf Camp adventure here! ‘Like’ us on FB for travel inspiration, photos, videos and more blogs and follow us on Instagram for travel pics!